Milan, Italy — Italy’s big election starts tomorrow (voting occurs on Sunday and Monday) and the general thinking is that centre-left candidate Pier Luigi Bersani is going to emerge as the winner. Well, technically because this is a parliamentary system his party is running, and the thinking is that his party, the PD, will win the most votes. But that’s just what’s most likely. People still think that Silvio Berlusconi has a shot of winning, as he’s only a few points behind in the polls, and there are still between 20-30% of voters undecided. How has Berlusconi made it a race? Simple. Promising to refund a tax. Free money for voters. If you look at Berlusconi campaign literature, the very first point is Aboliamo l’IMU. The IMU is a small property tax that the Mario Monti government levied on all homeowners that took in about 4 billion euros. I spoke to some people who work for Berlusconi’s campaign, who explained the salience of the issue. At 78% it’s well above the US level at 67%. And so if you thought homeowners were a powerful special interest in the US, then they’re even more so in Italy. So Monti offended a huge bloc of voters by passing this tax, and now Berlusconi is promising to refund it. But there’s a deeper symbolism to the tax. The tax represents, to some extent, a concession to the outside world. Brussels likes the tax, along with the rest of Mario Monti’s fiscal consolidation moves. Financial markets like the tax. The tax isn’t just a hit on homeowners, it represents an imposition on homeowners for the benefit of the outside world. This is the key vein of anger that Berlusconi’s campaign attempts to tap into. If there’s one thing that Berlusconi is not, it’s the Merkel/Draghi/Lagarde-approved candidate. And he’s hoping that this catapults him to victory. 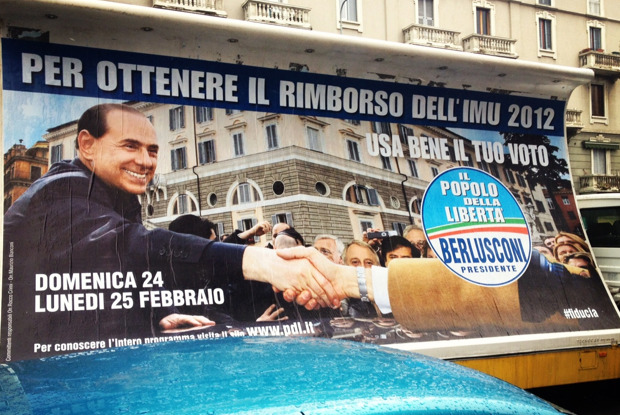 Here’s a poster outside of Berlusconi’s Milan HQ. 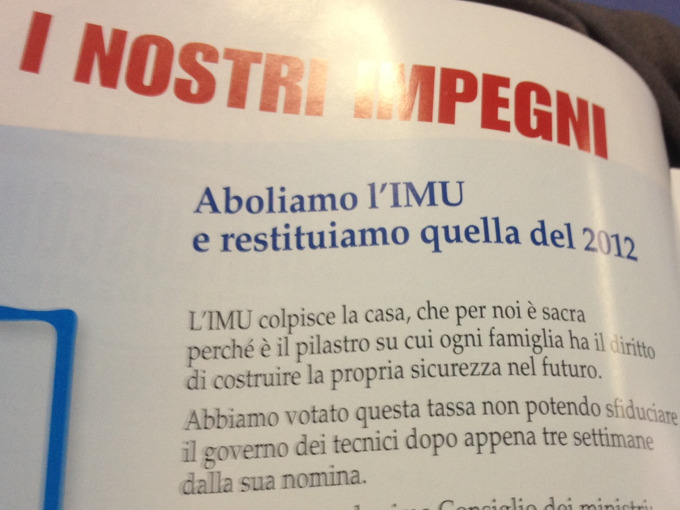 Note the top: Rimborso Dell’IMU.